More than 90 comedians are sharpening their wits and preparing their funniest punch lines for the 34th Edition of the Just for Laughs Festival, July 13 to August 1. Among highlights, veteran comic Kathleen Madigan, winner in 1996 of the American Comedy Award for Funniest Female Stand-Up Comic, returns to perform The Mermaid Lady Tour, July 26, 7 pm, 5e Salle, Place des Arts. Known to Montreal audiences for his rants and acerbic style, Lewis Black tells it like it is in The Emperor’s New Clothes: The Naked Truth Tour, July 27, 7 pm, Théâtre Maisonneuve, Place des Arts. Her face is familiar to Seinfeld fans, where she played Elaine, Julia Louis-Dreyfus will talk about the political satire show Veep, where she plays a starring role. Joining her will be fellow cast members Tony Hale, Timothy Simons and David Mandel. An Evening with the Cast of Veep will be on at Maison Symphonique, Place des Arts, 7 pm, July 27. Jay Pharoah, stand-up comic and cast member of NBC’s Saturday Night Live, will host a lineup of guests at JFL All Access Live with two performances at Club Soda, 10 pm, July 27. Comedian and actor Nikki Glaser and guests perform Not Safe w/Nikki Glaser at JFL All Access Live in two shows starting at Club Soda, 10 pm, July 30. Comic improviser Russell Peters, known for his energy and trenchant racial and cultural observations, hosts a comedy night at Salle Wilfrid Pelletier, Place des Arts, 9:45 pm, July 30. All sweetness and light until she opens her mouth, two-time Emmy Award winner Sarah Silverman will demonstrate why she is a somebody in stand-up comedy, at Maison Symphonique, Place des Arts, 9:30 pm, July 30. The Ethnic Show brings together seven comedians from a range of ethno-cultural backgrounds – Nigerian-American Godfrey, Greek-American Yannis Pappas from the Bronx, Puerto Rican Gina Brillon, Jewish American Jessica Kirson, Italian American Dom Irrera, and Nemr Abou Nassar, a Lebanese American said to pioneer the stand-up comedy scene in the Middle East. The host is Montreal-born and raised Rachid Badouri, whose parents are Berbers from Morocco. It happens at Club Soda and Metropolis with 19 performances July 13-28. 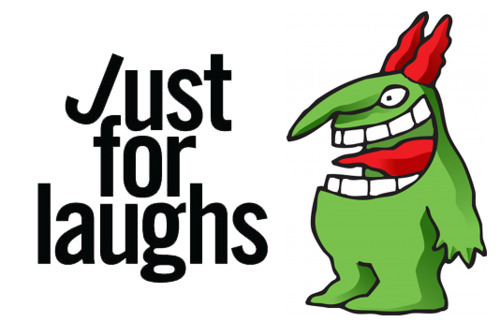 Be the first to comment on "Just for Laughs sets itself up to tickle your funny bone"